For a retro-reflective sensor the transmitter and receiver are incorporated into one housing. By means of a reflector the transmitted light is returned to the receiver. An object in the beam path interrupts the beam and triggers a switching operation. Transparent objects such as bottles or foils can be detected better than with a through beam sensor because the light beam must pass the object twice and is thus weakened twice as much as with the through beam sensor. Since the transmitter and receiver are integrated into one housing only one voltage supply and thus only one cable are necessary. 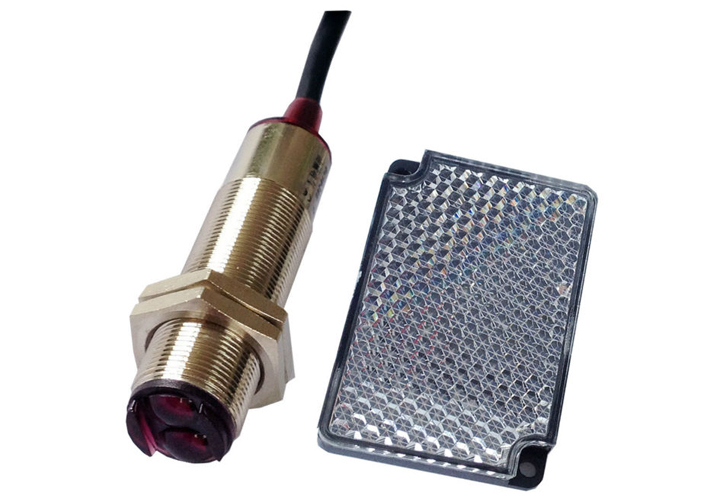 Compared to a through beam sensor, a retro-reflective sensor has an average excess gain. An object must have the size of the optics directly in front of the optics and the size of the reflector directly in front of the reflector. Copyright © 2015, Shiva Electronics. ALL RIGHTS RESERVED. Designed and developed by Digital Space Inc.